Those of you who run popular websites have had to deal with bad bots and malicious agents in the past. They can put unnecessary load on your website and cause your business a whole host of issues. 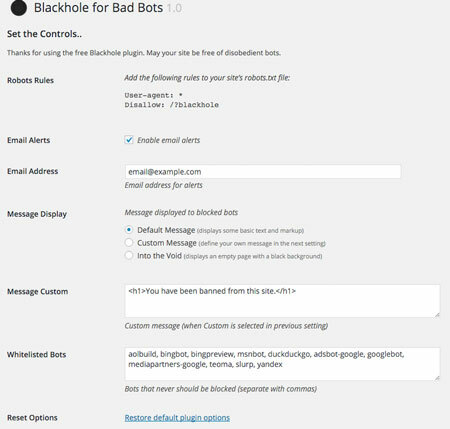 Blackhole for Bad Bots is one of many plugins you can use to deal with these types of attacks. 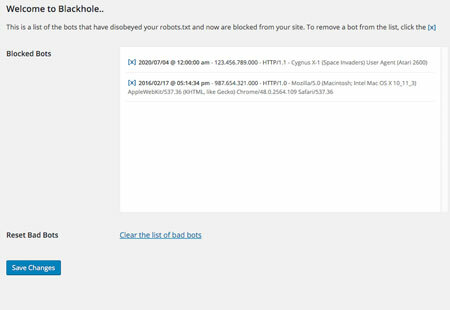 Blackhole for Bad Bots adds a hidden link to your page that catches bots that ignore your robots.txt rules. Once trapped, these bots won’t be able to cause your site further issues. The plugin doesn’t block Googlebot and other major search engines by default. This plugin should not be your only line of defense against bad bots and hackers, so you can always use it with other security plugins. You have the option to customize messages displayed to block bots. This is a free plugin. Add META Robots To Your WordPress Blog with META Robots!